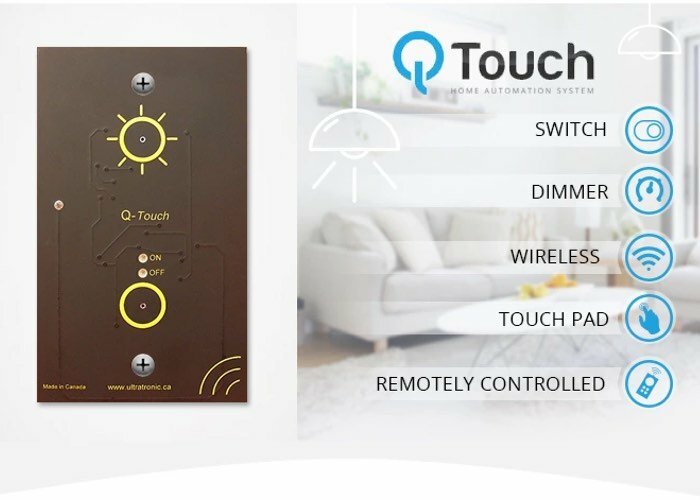 Those of you looking to set up a home automation system may be interested in a new device that has been created by Lesfar Nacer based in Canada called the Q-Touch. The Q-Touch system has been specifically created to provide an easy home automation system which features wireless remote control using a companion smartphone application. Watch the video below to learn more about the Q-Touch home automation remote application and switches which can transform your home into a smart home. Developer Lesfar Nacer explains more about the Q-Touch home automation system’s inspiration, design and functionality. Electric Switches have remained the same for more than a century. We have reinvented the electric switch with an Intuitive Interface, Connectivity and Intelligent features. We are pleased to launch the next generation Q-Touch switches and Dimmers here. For more features, you can program Q-Touch module to work automatically when you go in vacation or you are away from system. Only one event per day for all week days. Second event for a day will overwrite the previous one. Each day of the week can be programmed by a event (time-on and time-off). The program will be repeated every week. U can select one or many switches for each program. One program can be set in a switch. The Q-Touch Network is a multi users interface that enables each user to control the Q-Touch remote and Q-Touch switches from there smart phone or computer. With Q-Touch, you control your electrical system privately and you receive feedback information from any point in your home in real time. You can also connect to your private server from anywhere in the world. Each switch is programmable to be either an on-off switch or a dimmer. Simply press the bottom button for 3 seconds, the switch becomes a dimmer. Simply press the top button for 3 seconds, the switch becomes a simple on-off switch. The Q-Touch project is currently over on the Kickstarter crowd funding website looking to raise enough pledges to make the jump from concept to production. So if you think Q-Touch is something you could benefit from, visit the Kickstarter website now to make a pledge and help Q-Touch become a reality. If you are thinking of setting up a home automation system you might be interested in our Home Automation Hubs and Systems Guide.